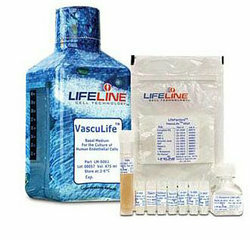 Includes VascuLife Basal Medium - 475 mL; VascuLife VEGF LifeFactors Kit. VascuLife VEGF (containing Vascular Endothelial Growth Factor) is a new low serum medium optimized for the rapid proliferation of human endothelial cells including Human Umbilical Vein Endothelial Cells (HUVEC), aortic endothelial cells and other human large-vessel endothelial cells. VascuLife supports the growth of these cells in a low serum environment. Lifeline's cell culture medium contains no antimicrobials and no phenol red since these components can cause cell stress and "masking effects" that may influence experimental results.